The Gold Plush XL Microfiber Towel measures 25 x 36 inches and features an outstanding 75/25 blend of polyester and polyamide. The microfiber’s weight is 380 g/m², making one very soft towel! The Gold Plush XL Microfiber Towel is made of Korean-made fabric sewn in China to provide a better towel at a lower cost. The towel is much more durable and long-lasting than terry cloth and retains its softness. Drying or buffing - The Gold Plush XL does it quickly with its massive size! 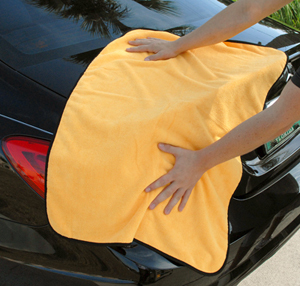 The Gold Plush XL Microfiber Towel is perfect for buffing because it has a deep pile where dirt and dust can accumulate away from the paint, rather than being rubbed into the paint. Plus, the long, silky microfibers do an excellent job of massaging away fingerprints and smudges. Dampen the Gold Plush XL Microfiber Towel with water to turn it into an all-purpose cleaning towel. Use it dry to quickly dust off your interior surfaces. Buff your vehicle when applying spray wax. You have to feel this towel to believe it! The Gold Plush XL Microfiber Towel is incredibly soft and gentle on any surface.